Enjoy a BBQ dinner, drinks and music while watching local artists create original art works you can bid on during our live auction. Raffle and silent auction items too! Ticket purchase on-line coming soon!! Time to get your TRIVIA GAME ON! 5 nights starting next Tuesday, October 16th, at The Office Lounge. Sign up forms for teams and sponsors can be found under "Downloads" on the Livingston Rotary homepage, or register by contacting Andy Turner at American Bank. Come help us celebrate the new picnic shelter at Mike Webb Park (G Street Park)! The Water Spray Park at G Street Park has seen heavy use during the past three summers. In addition to families and daycares using the park, "Links for Learning" summer campers regularly visit the park as part of their weekly schedule. With hard work and generous support from various donors, we were able to finish this much needed shelter and gathering place for the community. The dedication will be held Tuesday, July 24 from 5:30 - 6:30 p.m. at the picnic shelter. Free ice cream from our local Dairy Queen will be provided. Please share with your neighbor and friends so we may get the word out! Enjoy a BBQ dinner, drinks and music while watching local artists create original art works you can bid on during our live auction. Raffle and silent auction items too! 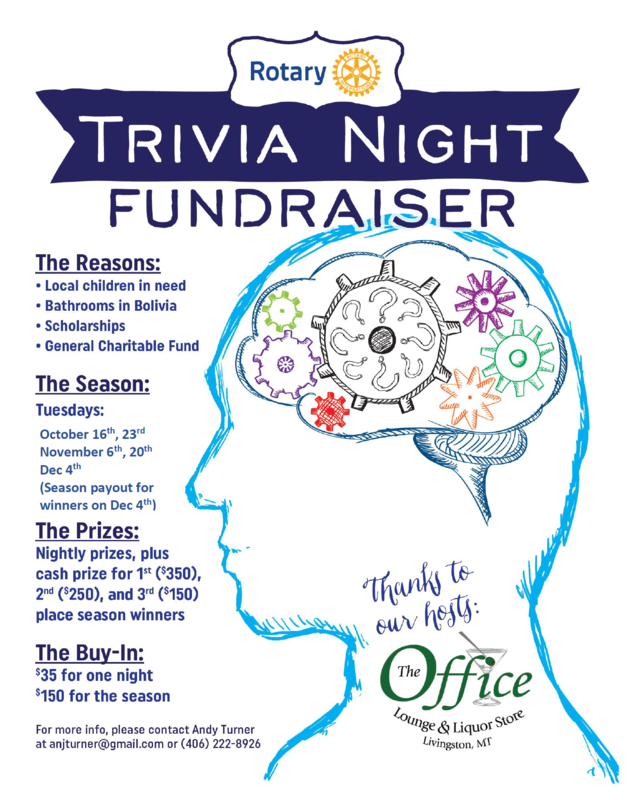 Rotary Trivia Season is upon us! 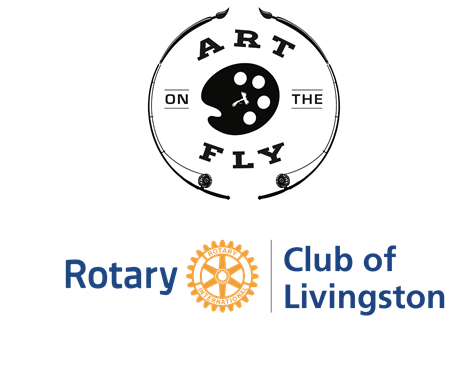 Livingston Rotary Club invites you to join us for a night filled with fine fare, live music and art. 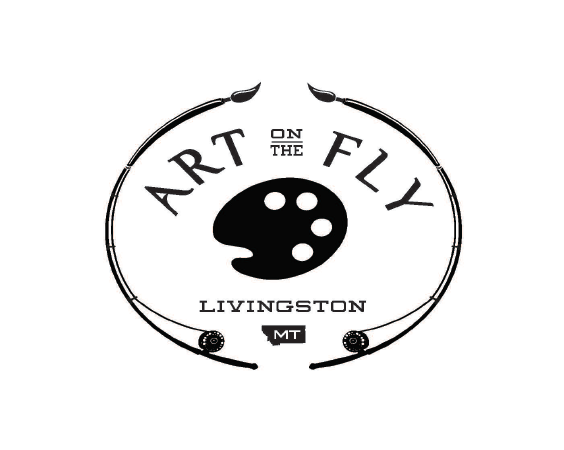 The event will be held on the 100 Block of North Main Street in Beautiful Downtown Livingston. The entrance will be near Derek De Young's Trout Confetti Fish. Don’t miss this opportunity to watch local artists create artwork that can be purchased at the live auction. 8:00 - 10:00 Dance to Quenby & the West of Wayland Band. For more information or to purchase tickets contact Andy Turner at 406-222-8926 or Tammy Haefs at 406-222-9010. 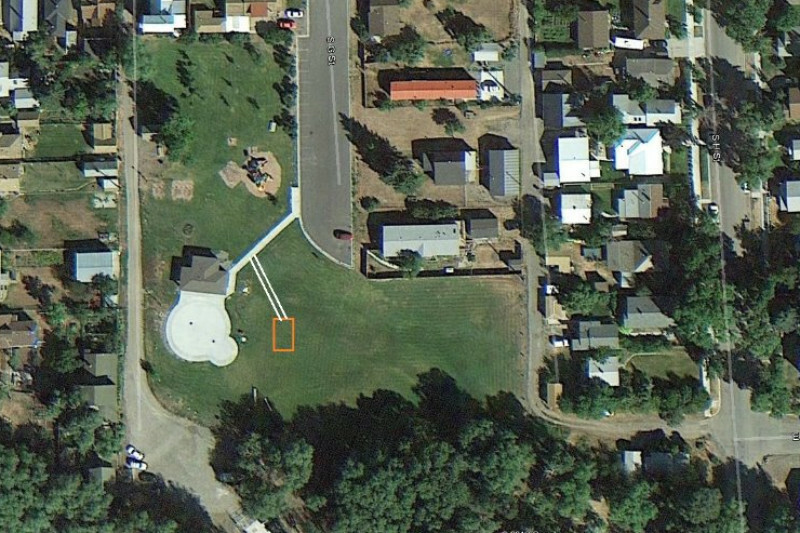 Livingston Rotary is embarking on another project to improve Mike Webb-G St Park! As part of our 100 year celebration, we are in the early stages of planning a 20’x24’ shelter to offer a much needed shaded picnic area for park visitors. Our fundraising goal is $15,000 with a building completion date in late May or early June 2017. Please help us continue to improve our City Parks by donating to this gofundme page, or see your local Rotarian to find out how you can help. Thanks Livingston for your support over these last 100 years, we look forward to serving our community for many years into the future!